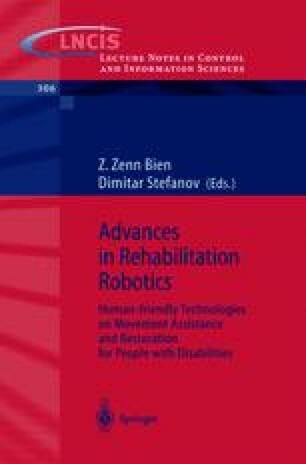 An electrically assisted walking aid with a force-sensing device embedded in its supporting arm has been developed. The force sensor consists of a pair of Ushaped members joined by four rubber springs and four gap sensors that detect the relative displacements between the members. It calculates forward and vertical forces from the displacements, and thus determines the torque about the vertical axis applied by a user. Test results showed that the sensor has sufficient precision for an electric walker.